Let’s start with the core of the dip pen system: the pen or nib. Choosing the right steel pen out of the thousands of different variations made over the last 180 years can be simple, or can be an opportunity for exploration. You must first start with your intended use. There are three main uses I’ll cover. If you can think of others, let me know in comments. For about 80 years you had two main choices for writing things down: pencils and dip pens. Pencils are their own sub-world, one which has grown in interest lately, but one which I will set aside for the moment. For most people, when they needed to write a letter for pleasure or business, when they needed to record an entry in a store’s ledger, write out an order on a bill head, record a marriage, birth or death, or any number of a thousand things people write on a daily basis, they would have reached for one of a thousand different styles of standard, daily-writing steel pen. These daily writing pens come in many styles, sizes and degrees of firmness. But generally, they are easy to write with, which means not too sharp nor too flexible, will hold a decent amount of ink and will be fairly durable. The vast majority of vintage pens you encounter will fall into this category. The 048 Falcon, already mentioned in an earlier post, was one of the quintessential examples of an every-day pen. Esterbrook’s 788 spoon pen was another popular style. Some of my other favorites include the Eagle E840 Modern Writing, or one of the smaller stub pens, like the Esterbrook 239 Chancellor or the Hunt 62 Vassar (or x-62, the silverine version of the 62). Any of these pens work wonderfully for writing letters, paying bills, writing in a diary, or whenever you need to just write something down without fanfare or flourish. I am not aware of any modern steel pens being made with this purpose in mind. All of the modern nibs currently being made that I’m familiar with are geared towards one of the other two uses: decorative writing, or drawing. Of course, I’m willing to be corrected. Many are aware of what decorative calligraphy looks like, but few have seen examples of every-day kind of writing. Here are two examples: the one on the left was written with a small stub (a Hunt X-62), and the one on the right is with a pointed pen (Eagle E840 Modern Writing). Also known as Calligraphy, this form of writing is more specialized with its own criteria for a good pen, depending on the style. Traditionally, pointed pen calligraphy fell into a couple of camps with Copperplate or Engrosser’s script and Spencerian as the two most widely-known types, each with multiple variations. To see some wonderful examples, there are a lot of older sample books out there for perusal. One example is the Portfolio of Ornamental Penmanship on the Internet Archive. Pens used for decorative writing generally have a much greater range of flex and tend to be softer (easier to flex) than general writing pens. They are also often very sharp to make very fine hairlines (the thinnest part of a line). This can make them very difficult to manage for beginners. It is often better to start out with a slightly stiffer, less sharp pen, like one of any number of modern nibs like the Zebra G.
Some vintage general writing pens can be used for decorative writing if you are writing small, and the pen is particularly flexible, like the Esterbrook 453 Business and College pen. TIP: Generally, any vintage pen marked “College” will be relatively flexible and able to make a decent flexed line. Most US and many European nibs marked “EF” will also make thin lines with some decent flex. Pointed pen calligraphy has also seen a surge in interest with the rise in so-called Modern Calligraphy and the spread of Pinterest. (A good source for information on the modern style is Postman’s Knock.) Modern decorative writing will often use the same kinds of pens as the more traditional forms, with perhaps a bit more tolerance of thicker hairlines, depending on the style. 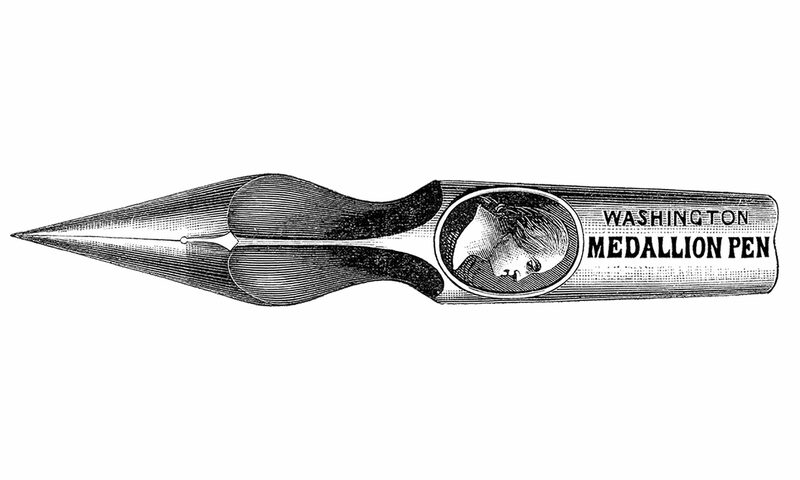 Pen and ink drawing and sketching go back further than steel pens, but since their advent, many artists have discovered the ability of these tools to deliver clear lines, line modulation (thick and thin) in the same stroke as well as durability. Cartoonists, especially, have been drawn to the steel pen. There’s the famous story of Charles Schultz, the creator of the comic strip Peanuts. He would only use the Esterbrook 914 to draw all of his strips. The 914 is just the Radio Pen version of the #14 Bank pen. (Esterbrook’s Radio pens have nothing to do with the invention of Marconi, but “Radio” refers the silvery coating added to the nibs that supposedly helps prevent corrosion). Many modern nibs are made for comics/manga artists. These nibs, like the Zebra G, the Tachikawa G and others, are made in Japan and marketed directly at manga artists, but they can be quite good nibs for writing as well. Some of the smaller vintage nibs are also explicitly labeled as Artist (like the Hunt 100), Drafting, or Mapping pens. Mapping pens tend to be extremely sharp, very fine and delicate pens. The 354 and 355 Art & Drafting pens by Esterbrook are two examples of these kinds of pens. Some people do use these pens for very small calligraphy, but the tines are so small that while they are soft, and flex easily, they cannot flex far, so the shading is minimal. My late father-in-law, a geological engineer used 355’s for drawing his maps. The experts at decorative writing all say to start with a beginner type of nib and get comfortable with it and familiar with the motion of flexed writing. You can then move “up” to more difficult pens (usually sharper and softer with more flex) as your control gets better. But of course, a pen without a holder won’t do you much good, so the next installment of this series will look at the next essential tool for using steel pens. This website allows us to tag along on your research process. Thank you for creating it.